Canned responses are predetermined responses to common questions. They allow you to respond faster to inbound messages, and lessen the repetitive nature of replying to frequently asked questions. 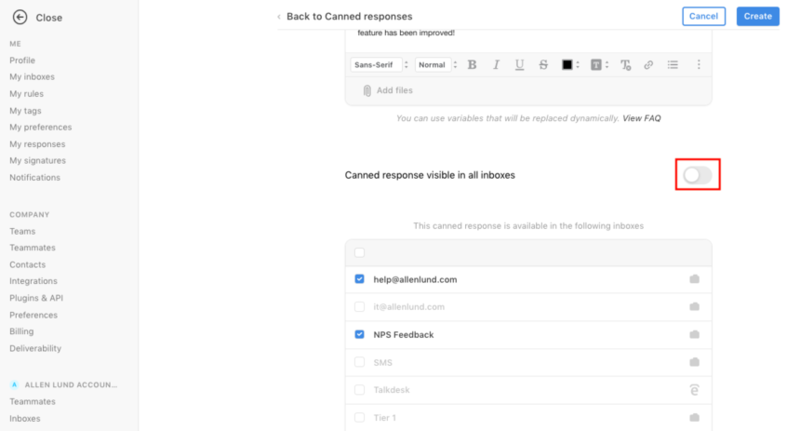 Front allows you to create individual and team canned responses. 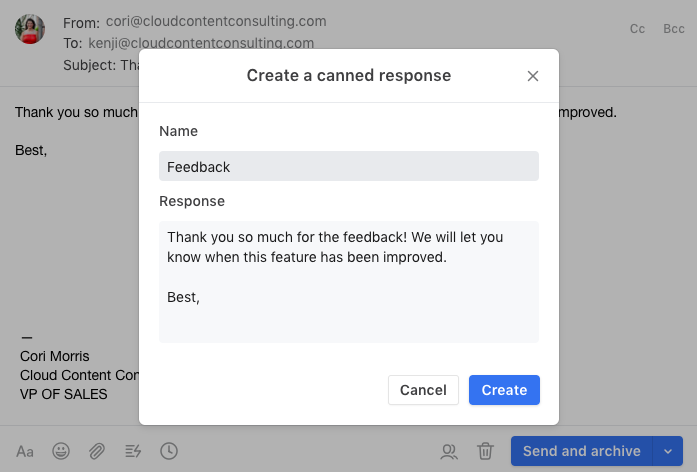 Individual canned responses are visible to only you, and team canned responses can be visible to your teammates on a per inbox level. Both admins and non-admins can create canned responses. There are two ways to create a canned response. Choose whether you want to create an individual or a team canned response. For individual canned responses, go into your Settings and select My responses. 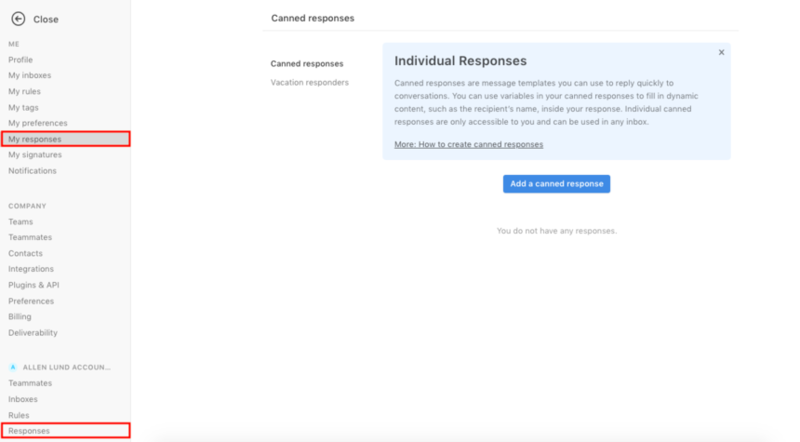 Individual canned responses are accessible only to you and can be used in any inbox. For team canned responses, select Responses. Team canned responses can be used by any teammate. For those on the Enterprise plan, team canned responses are set up per Team. Click Add a canned response. Create your canned response. Front supports variables as well. 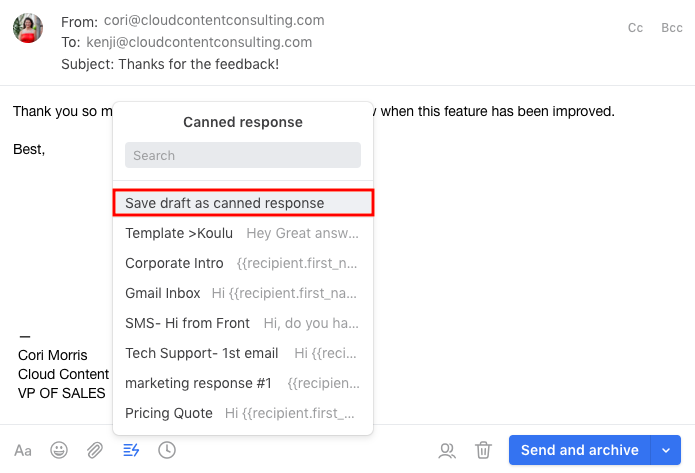 Format your canned response by highlighting the text you want to edit. If you add a subject, the subject of the conversation will change every time you use the canned response. It will override the previous subject. 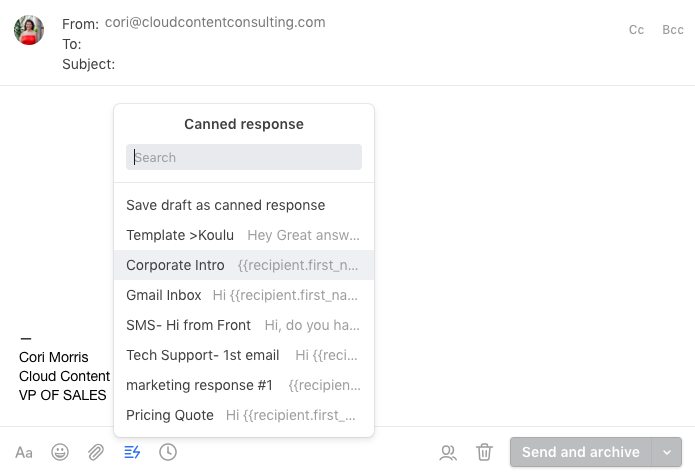 Once the canned response is created, turn the toggle to select what inboxes you want the canned response to be visible in. Now it's time to use the canned response. Click the canned response icon to pop up your list. Choose the response and your message will be drafted. Make edits as you wish before sending. Click the canned response icon to pop up your list. Select Save draft as canned response. Enter the name of your canned response. Then click Create. This canned response will now be available for future use. Is there a way to create individual canned responses? Hi Joyce, yes! If you go to Settings, Responses, click in to any of your responses and select Inboxes. That's where you can set it to only show for yourself. Cori Morris great thank you! Joyce, we're getting ready to launch a new design for canned responses. It will separate private and team responses. You should expect to see this announcement in the next few weeks. Cori Morris Could you elaborate on this? Or is there any way to give me a quick demo/design overview? We're evaluating whether to make the switch to Front for our support team (we're currently on the trial.) And canned responses is one of the major barriers for us right now. Joyce, sure! Your Account Manager will reach out with more info. Canned responses are fantastic! Thank you! 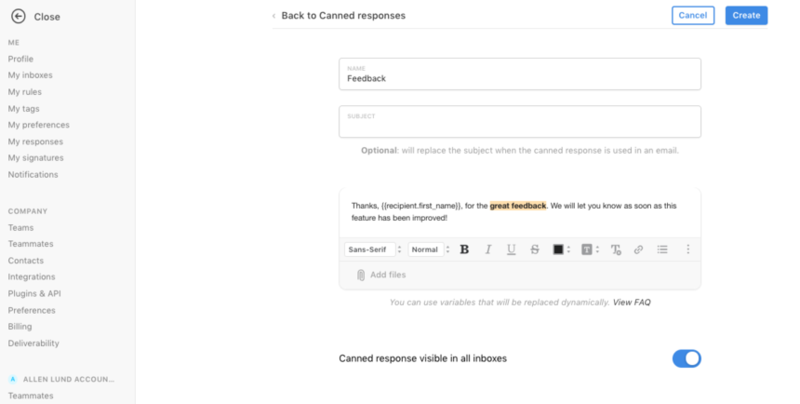 A great addition for us would be a way to include a placeholder within canned responses which had to be replaced before sending became possible. 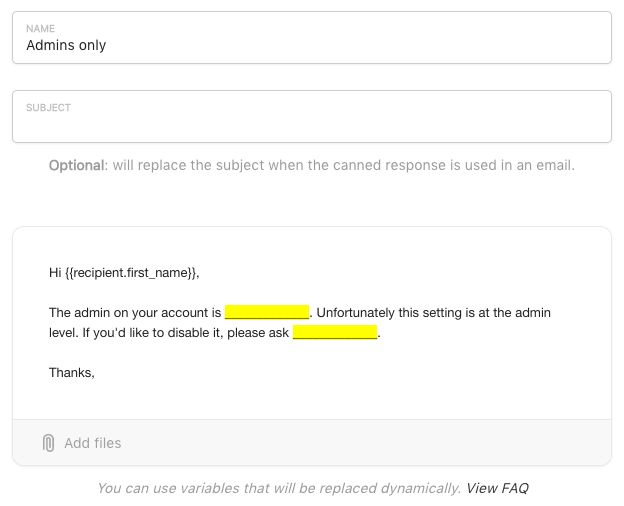 To avoid team members accidentally sending an email containing a placeholder symbol (in cases where variables aren't appropriate / available). Great suggestion! I'll be happy to add this to our list of requests. Sarah, we've decided that this isn't a feature we're going to prioritize right now, but the best way to accomplish this in the interim is to utilize the highlight tool. Links I'm using in canned responses don't show up as links in my actual response, just plain text. Why? You will need to click on the “i" next to the subject line, and copy the Conversation ID. Please share it with us so that we can investigate. We loved the templates but since the update we cannot use some of them. I explain it appears that some aprt of our templates that should modifiable are not anymore. As per my pdf attached, we shoukd be able to modify the part in red but we cannot. Those are past from Word, could this be the issue ? question or suggestion: is there a way to automatically fill in a contact in the To: or CC: line when a canned response is selected? There is a particular canned response that I use where I always CC: a particular contact. Would be great if that was automated. I don't think it's currently doable, so maybe a suggestion for future development? Hi Joe , that would be a feature request! You're right that we don't currently have this available, but I've logged it for our team. Thank you for the suggestion!